Not just a little cold, but chilled to the bone -25 degrees Celsius lake effect wet cold. 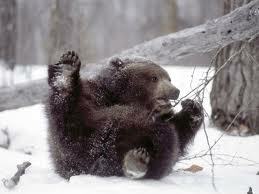 The kind of cold that leaves you feeling uninspired, making you want to give in and hibernate like a great big bear. I say instead of fighting it, trying to beat the winter blues, give in!!! Let yourself hibernate, be warm lazy and indulgent. Drink and eat rich, hot safetying comfert foods. I'm leaning towards meat loaf, chilly, warm breads and anything with cream or cheese. Most animals put on weight in the winter to keep warm, and were animals right? So no wonder we crave these foods. So for at least one freaken freezing day, fill your belly's to keep Jack Frost out. Crawl under the covers and pull them right up under your chin, go to bed early and sleep late. I like to sleep with a duvet and two quilts in the winter, the heavier they feel that more cozy I am. Also nothing warms a body like another body, snuggle, make love and have lenghty conversations under the covers. As I have said before bed is my happy place and for more reason than one. If you are lucky enough to have a fire, read that great deep novel you've had on your shelf for years. If you don't have a fire, be indulgent turn the heat up for a day or two. Since its too cold to go outside your not spending money so you can justify affording it. I know its not environmentally friendly, but who likes cold floors and bathrooms in the middle of the night or morning. Wear large, comfy. cozy clothing, do not worry about being stylish just warm and bulky. Your cheeks are going to have that nice winter rosy glow, so you'll look pretty already. Hopefully this post will make you feel less guilty about indulging in your inner bear. Stay warm, stay safe and enjoy the time you have with your loved ones. Even though I hate the cold, driving through this frozen city tonight I was feeling a little nostalgic about winters when I was a kid and loved playing in the snow. Why didn't we feel as cold then?